Workshops, books, and techniques for healing and self-care abound today. While these are all valuable tools, the author contends that meditation is the vehcile behind these practices which faciliates all New Life. Brother/Doctor Bernard Seif, SMC, EdD, IABMCP ministers as a clinical psychologist, spiritual director, and abbot and founder of the Salesian Monastic Community, HC 1, Box 455, Frantz Road, Brodheadsville, PA 18322, (717) 992-3448. He is on the Board of Directors of the Fellowship of Emerging Religious Communities and a Professional Member of the National Qigong Association USA. Brother Bernard holds a post-doctoral diploma in Behavioral Medicine and is a Certified Bodywork Therapist with Associated Bodywork and Massage Professionals. Chi gong, yoga, tai chi, Therapeutic Touch, meditation, and running bring joy and healing to his life and he employs these modalities treating his patients. A man who does me the honor of coming to see me for spiritual direction once said: I really like coming here. You really do it! (Spiritual direction, in the Christian tradition, involves helping a person to clarify the spiritual promptings within him or her and is typically carried out through one to one sessions, listening, and encouraging. It is similar to the relationship a person might have with a guru or master in many of the Eastern traditions but is more focused on the existential experience of the directee.) I asked this person what it was that he though I did. He went on to say that many people preach getting along with one another and talk about respecting the spiritual and healing practices of other traditions, but that he has not seen many really do this. After our meeting I mused over the meaning of our conversation. The directee was aware of the fact that I have been to Hong Kong to teach health care professionals and that I gave a retreat there. He seemed more taken, however, by the fact that I made and effort on my own to spend some time in a Buddhist monastery on Landau Island while in Hong Kong. He was also well aware of the fact that one will often find me at the Hindu ashram not far from our Roman Catholic monastery here in northeastern Pennsylvania. As I contemplated these issues, I was very conscious of the fact that my interest in the way that other people worship and open themselves up to healing is really not all that virtuous. I have always been captivated by these matters and am perhaps pursuing them a bit more selfishly than altruistically. Whatever the case may be, a parallel scenario to the one outlined above about really doing began to emerge in my mind. As a clinical psychologist specializing in behavioral medicine, I often treat people with physical as well as emotional disorders. Many of them are caught up in what Westerners refer to as the fight-flight response. This is a physiological mechanism which mobilizes us to protect ourselves either by fighting off or fleeing from a real or imagined physical or psychological danger. The fight-flight response is stuck in the on position for most of us. I typically prescribe some form of meditation practice for my patients caught in this unhealthy mind-body cycle. Those who do their homework and practice meditation typically respond very favorably in terms of their physical and emotional well-being. They really do it, to use the phrase my directee was kind enough to use about me. Those who do not meditate seem to have no fire within, and little progress is made. What progress is made is done so at a much slower pace. My reverie then took me a level deeper. It has long been my observation that many people who come to me for professional services, in this case bodywork (a generic term for specialized forms of massage therapy), are often very out-of-touch with their level of Qi or life force, and even more so about how it is flowing or blocked within them. This is surprisingly true very often in the case of people well-trained, including instructors, in one or another form of the martial arts. Even those with black belts or similar distinctions often have little training in or appreciation of Qi and its relationship to meditation, in my observation. While working with their painful or constricted physical areas, I try to teach patients something about the life force and the need to cultivate it and allow it to move throughout the body and beyond through the process of meditation, and personally work at actually removing blocks in the meridians, cultivating Qi, and circulating it during the bodywork itself. One can call the process Qigong bodywork. There are times when an individual will come for bodywork complaining that his or her last bodywork therapist or two didn’t do it for this client. The description given is typically that the bodyworker was mechanical or anatomical in their treatments. Once again, there seems to be no fire in the process. What is it that is missing within preachers, patients, bodyworkers, and martial artists which keeps them from moving to a deeper, more healing level? Why is there little or no fire? What is missing in our practice at times? These thoughts tumbled through my mind and eventually moved from right brain musings to left brain words--a sometimes painful process--in the from of this article. After twenty-five years of clinical practice, my sense is that the Eastern spiritual and healing practices, which gained greater acceptance in the United States in the late 60s and 70s and beyond, have been taught largely as calisthenics or physical exercises. Yoga and Tai Chi seem to be especially vulnerable to this superficial kind of training. Qigong is to some extent less vulnerable to this since the very nature of Qigong emphasizes the cultivation of Qi and therefore militates against the superficial imparting of this form of self-healing and healing for others. The question arises, how can one impart or fan the fire of Qi? After more than thirty-five years of meditation practice and a little less so of healing practice, I am convinced of the intimate relationship between meditation and healing. The bridge between meditation and healing appears to be Qi. It is clear to me that I am significantly more intuitive in terms of diagnosis and treatment, as well as in terms of personal interaction, when I am faithful to meditation. Contemporary society is blessed with an abundance of books, audio and video tapes and the like on the topic of meditation. It is, therefore, easy enough to find material on ways to meditate. My caveat is simple. Our tendency (especially Westerners) is to stay in our heads. Rather than quietly spend a little time on a regular basis meditating, we much prefer to read a book about it. Also, one can easily remain in his or her faith tradition, and even deepen it, through the practice of meditation. Meditation is not about conversion to another faith tradition. I encourage people to take a regular time for meditation each day if possible. It need not be a long period, perhaps ten minutes for a beginning. It is helpful to have a regular time and place for meditation so that our mind-body gets into the habit of doing this. This also helps to diminish resistance. We very much need to guard against perfectionism. 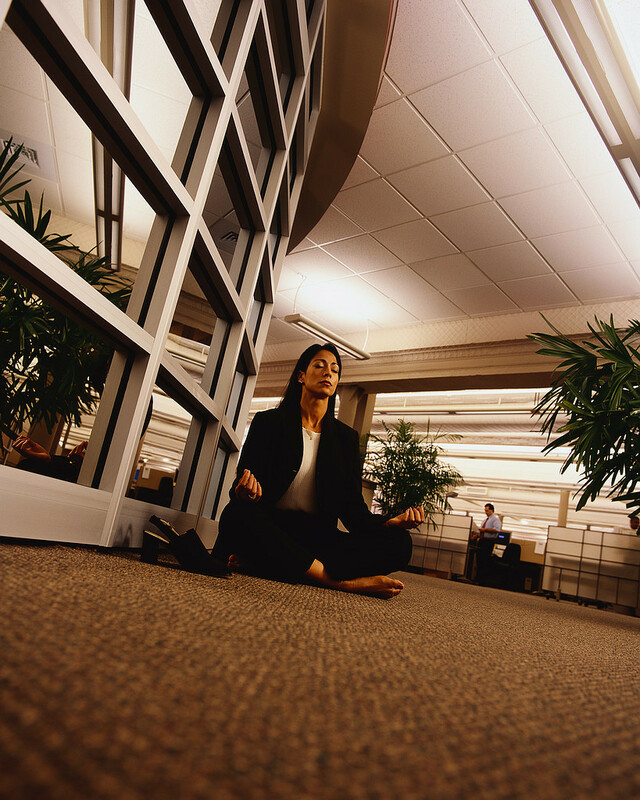 Many of us have a sense that we cannot meditate as well as somebody else, or else that we can t sit still long enough. In truth, our whole meditation may simply be returning to focusing on our breath or returning to a mantra/prayer word which we have chosen to repeat in our mind as a meditation tool. We are naturally restless. That need not stop us from meditating. The purpose of this article is not to teach meditation techniques but to encourage people to utilize them in simplicity and without judgment of self or others. The fruit of meditation is not in how we feel in our time of meditation but in our ability to be a bit more patient, confident, available for others, open to the Sacred, etc., between meditation times. Meditation fans the fire of Qi, which then deepens our practice, be it spiritual or healing, or some synthesis of both. If you are fortunate enough to be training in some form of healing or martial arts and there is no meditation component, I encourage you to add that thought the use of another teacher or by asking about it with your present teacher. Spiritual/healing practice without meditation and its related Qi is like taking a walk on a very cloudy day. Light is there but it is significantly reduced. As we deepen our practice through meditation, I believe that we will truly allow East and West to meet and complement one another in a much more profound way. Meditation is the bridge. It is what really allows yin and yang to be one in the Tao. The seeds of this article, like many other things in my life, bubbled up into my psyche during the process of meditation. Please share whatever emerges with the rest of us as you deepen your meditation process. Perhaps it will be a gentle presence, appropriate assertiveness, a deepening of life lived in your own spiritual or healing tradition. Whatever it is, please accept it without judgment and pass it on. Our world needs it. Thank you! (1999). Meditation: Fanning the Fire Within Our Practice. Qi: The Journal of Traditional Eastern Health and Fitness, 9, 1 (Spring), 6-8.